Darren Urban of the Arizona Cardinals official website put together a great compilation of Warner’s top 10 performances as a Cardinal. Warner had to be great in a 51-45 overtime win, and he delivered his finest performance in a Cardinals’ uniform. His spectacular day was underscored by the fact he had more touchdown passes than incompletions, a fitting final game at University of Phoenix Stadium – which included a goodbye wave to the crowd when it was over. The Cardinals achieve the improbable – a trip to the Super Bowl – as Warner has a nearly flawless performance. Three TD passes go to Larry Fitzgerald, but it’s the final drive in which Warner coolly shows his best, including a screen pass to Tim Hightower for the game-winning score in a 32-25 win. The Cards opened the season with a grind-it-out win in San Francisco, and Warner clearly wanted to throw more. He got his wish the next week against the Dolphins. He, Fitzgerald and Anquan Boldin were the stars as Warner achieved the third perfect passing rating (158.3) of his career , tying Peyton Manning for the most all-time in a 31-10 victory. The Cards were coming off a difficult season-opening loss to the 49ers and traveled cross country for what looked like a must-win. The Cards did – 31-17 – as Warner hit on 92.3 percent of his passes to set an NFL record for completion percentage. It’s the highest loss on the list, but despite the gut-wrenching ending, Warner – save for his one interception right before halftime, a painful step back – nearly brought the Cards a title. 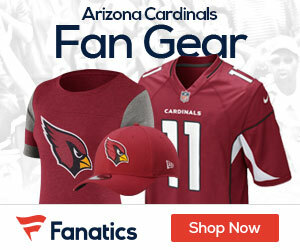 His postseason connection with Fitzgerald reached a zenith with what looked like the game-winning points, a 64-yard touchdown pass late in the fourth quarter that briefly gave the Cards the lead in a 27-23 loss. Warner went to play the Bears after one of his worst games as a Card (five interceptions, six turnovers) in a home loss to Carolina. The Cards were also without Boldin that day in the Windy City. All Warner did was pick apart the Bears in a 41-21 win, using the Cards’ newfound running game to balanced perfection as he turned in his first five-touchdown-pass game in Arizona. Warner’s first season as a Card didn’t turn out the way he had wanted, and injuries robbed him of a four-game stretch early in the season. But Warner’s first trip back to St. Louis since he left the Rams couldn’t have gone any better, as Warner used 100-yard days from both Boldin and Fitzgerald to celebrate a perfect homecoming in a 38-28 win. Matt Leinart was the starter, but then coach Ken Whisenhunt sprung something new on the Ravens – the no-huddle offense with Warner at the controls. Playing about half the game, Warner couldn’t be stopped, nearly leading the Cards to an upset before Arizona lost, 26-23. It set Warner up for partial playing time the next two games, before Leinart got hurt, and showed what Warner could mean to the offense. So many emotions were wrapped up into what turned out to be Warner’s final game in St. Louis. Once again, he was unstoppable, piling up his stats before the end of the first half en route to potentially a huge day. But he suffered a concussion on a hit after a throw, knocking him out of the rest of the 21-13 win and the following week in Tennessee. It also made Warner think very carefully about his future in the game.